Kings Langley returned home with all three points after registering an impressive 3-1 win over Bedford Town in the Southern League Division One Central. 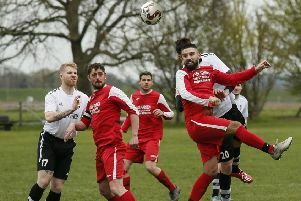 A controlled team performance earned Kings the points at The Eyrie as they pressed from the offset, with a rasping shot from Danny Hutchins deflected for a corner in the third minute. For the Eagles, Christian Lester was just unable to reach a cross to the far post, but Mitchell Weiss gave Kings the lead when he took Callum Adebiyi’s low cross with his back to goal and turned to drill his shot past Grant Beckwith. The Eagles gradually came back into the game, culminating with a superb strike by Stefan Powell matched by a flying tip over from Ant Ladyman. The reply was swift and telling, as Gary Connolly fed Ollie Cox, and when the cross came back over, the skipper took time to control the ball before firing in off the far post. The tide continued to flow against Town after the interval and a skilful one-two between Cox and Weiss ended with the latter’s shot cannoning back off the post. This proved to be the prelude for a ‘goal of the season’ contender though, as Adebiyi pulled a cross back for Connor Toomey to hit a devastating volley into the back of the net from fully 22 yards. Bedford gained some consolation when Josh Bamford stabbed in a lofted cross that Kings failed to deal with, and the striker netted again five minutes later when offside. A Connolly header from a Tom Carter cross, well tipped over by Beckwith, was to conclude the action as Kings completed a deserved win.